New Delhi, April 15: The Election commission of India (ECI) on Monday imposed a 72 hours ban on senior Samajwadi Party (SP) leader Azam Khan from election campaigning starting from 10 am on Tuesday, for violating the Model Code of Conduct (MCC) during his campaign held in Uttar Pradesh's Rampur. The action against Khan was taken for his derogatory 'khaki underwear' comment. 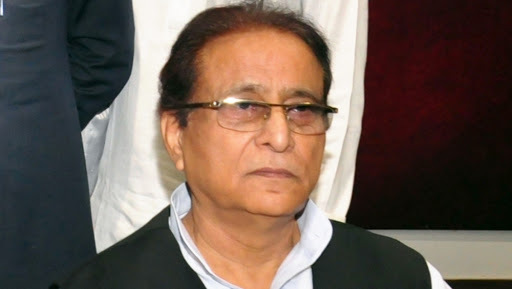 The SP leader Azam Khan on Sunday reached a new low after he made below the belt "Khaki" comment on Bharatiya Janata Party (BJP) candidate, who is contesting Lok Sabha polls from Rampur parliamentary seat. "I brought her (Jaya Prada) to Rampur. You are a witness that I did not allow anyone to touch her body. It took you 17 years to identify her real face but I got to know in 17 days that she wears khaki underwear," Khan said. Meanwhile, the SP leader has asserted that he did not name anyone in his rally. "If anyone proves that I have named anyone and insulted anyone by name, I will withdraw my candidature from the ongoing polls," the SP leader added. Earlier today, the Election Commission also imposed a similar ban on Uttar Pradesh Chief Minister Yogi Adityanath and Bahujan Samajwadi Party (BSP) chief Mayawati. The election body barred Mayawati from campaigning for 48 hours and Yogi Adityanath for 72 hours, starting from 6 am on Tuesday.